The Sawtooth Pony Club has announced the certifications of seven of its members at a testing held Oct. 6-7 at River Sage Stables in Bellevue. Members who passed their certifications were Willa Laski (D2), Carmen Leslie (D3 and C1), Giovanna Leslie (D3), Will Englehardt (D3), Scout Hutchinson (D3), Sarah Carty (C1) and Payton McCune (C1). To earn certifications, the members passed examinations that tested horsemanship skills and/or equine knowledge. 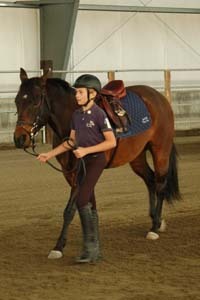 Each of the Pony Club certification levels is more difficult than the preceding one, and requires Pony Club members to learn more about horses and their care and to become increasingly accomplished riders and teachers to younger members. The top certification level is A level and is reached by fewer than 1 in 300 students. U.S. Pony Clubs, Inc. was founded in 1954 as a nonprofit youth organization to teach riding and horsemanship through a formal educational program. Youth members can range in age from 4 through 25. Local instructor is Sarah Berkowitz of Bellevue.